Skymall is dedicated to providing creative, high-quality products and solutions through our extensive portfolio of brands. Whether building new products from the ground up or re-imagining existing ones, our goal is to add value and create differentiation to better meet the needs of consumers. It’s this driving passion that inspires us to exceed the expectations of our customers, partners, and employees. For customer service inquiries or to initiate a return, please contact Skymall at questions at OverstockMarketplace@caglobal.com or 1-800-759-6255. You can initiate a return for new and unopened items within 15 days of delivery for a refund. To qualify for a refund, items must be in new and unused condition with all original materials and/or accessories. If a return is not received at our processing facility within 30 days, it may be subject to a partial refund. You will be responsible for return shipping costs. However, if the return is a result of a fulfillment error, product defect, or damage incurred during shipping, we will refund the full cost of the merchandise. We will provide a pre-paid return shipping label for Non-Buyer's Remorse returns. All returns are subject to inspection, and if found not to be an error on our part, the return shipping costs will be withheld from your refund. Stable Humidity – Pick your preferred RH level and 2-way humidity control does the rest. Whether it’s a large or travel sized humidor, regular tobacco or fine Cuban cigars, Schmécké offers humidity packs at the RH you need. Preserves Flavor – Proper storage is important in preserving a cigar’s flavor. Too dry and it burns too hot. Too humid, and risk cigar beetles and loss of flavor. 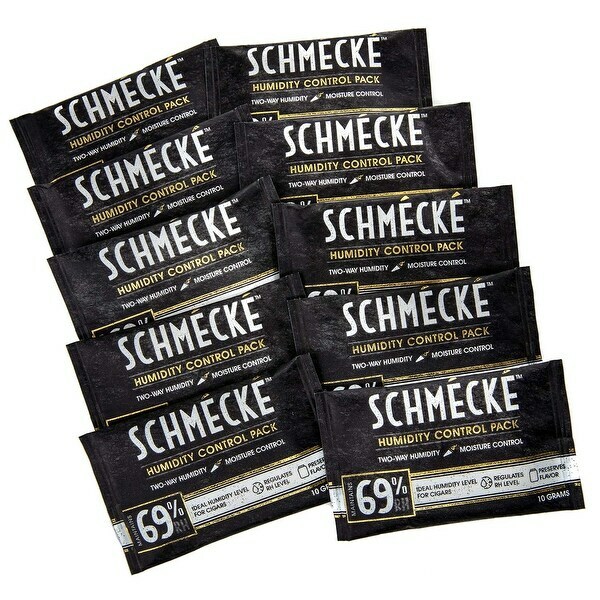 Schmécké humidity packs make it easy to regulate humidity and preserve the integrity of even the finest cigars. Zero Guesswork – Schmécké takes the guesswork out of relative humidity control. Just place a pack directly inside your humidor and reverse osmosis technology regulates humidity at the optimal level. Long Lasting – Each packet lasts about 2–4 months in a sealed humidor – up to half a year of guaranteed fresh cigars. When the pack becomes stiff, ridged, and inflexible, it’s time to replace. Unfinished or unused packs can be stored in a resealable bag for up to 2 years. 100% Natural Ingredients – Schmécké Humidity Control Packs are all-natural and free of chemicals. That means you can breathe easy, knowing that no unnatural ingredients or fumes come in contact with your cigar collection.